It somehow should have ended with much more of a bang and a pop, perhaps even a flash of fireworks, a ripped t-shirt and a night spent in the gutter. Well maybe not, but the final property square seemed to come and go with not much more celebration than a regular evening at the pub, which let’s face it, is still a cause for celebration. Mind you it was another lengthy absence since that last tour, a whole 4 weeks if I'm not mistaken and whilst these longer intervals do seem to have resulted in a better than average attendance, on the momentum side of things, the tour seems to have limped and staggered to its near end on dirty and bruised knees, wheezing like an asthmatic dog. But let's not get too down about it all, we should still celebrate the 9 hardy souls who were up for one final regular outing, especially as we saw the welcome return of No-Nickname Michael, still on the wagon even if he does look like he's clinging on for dear life (joke!) and after much persuading Aussie Pete who's month long abstinence of anything remotely approaching fun still had 4 days to run. Even the most forgetful of Monopoly students must know that the final property square on the board is Mayfair, the most expensive property and that's something that hasn't changed since the game was invented as this area of London is apparently still the most expensive place to live in Europe, never mind just the UK. Again those with a passing knowledge of London geography will know that Mayfair isn't a street or a station but rather an imprecise area, tucked in the corner of Park Lane and Piccadilly. There's a plaque in Stanhope Row which explains that this was the site of the oldest cottage in Mayfair which I guess is a good a place as any to concentrate the tour on. The tube journey to Green Park was uneventful apart from the fact that Gemma and Nicole, the ever-dependables from Pay Roll, bumped into George, a fellow Pay Roll colleague who upon being encouraged to forgo all thoughts of a quiet night in, finishing a dissertation, showed all the strength and fortitude of a jelly fish and crumbled all far too easily to join the tour before it shut ups shop forever. Managing to herd the unruly bunch of cats out of Green Park station we were soon into the 1st pub of the evening as it was just round the corner on Piccadilly itself. 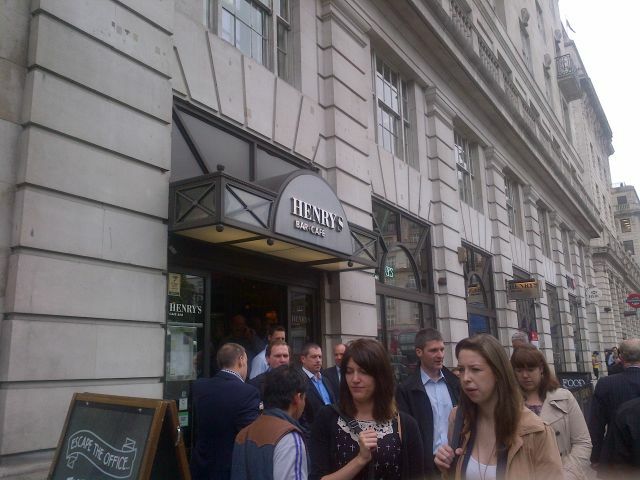 Henry's Cafe Bar is a chain of similarly named venues across the country it seems and this particular one seemed to be very popular with a noisy bustling crowd thronging the place inside. 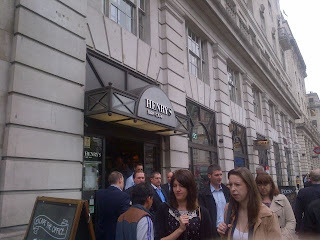 Still service wasn't too bad and with pints of Henry's IPA (not sure if this was the well known Wadworth brew or something rebadged especially for the pub) for Charlie and I, halves for Big-J, Gemma and Nicole, vodka and coke for George (she later claimed all beer is foul (!)) Bud for Buddy Rob (quelle surprise!) and nasty fizzy water for Pete our only job was to try to locate the Cask Marque certificate. No dice on that front and with the staff whizzing past clutching plates piled high with all manner of deep fried goodies we had to admit defeat and leave sans le scan. 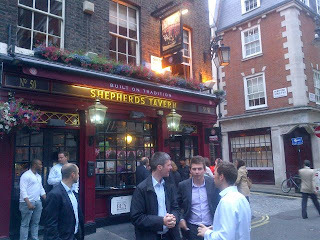 The next three pubs were all in a row along Shepherd Street and thanks to my awesome map reading (no one else was doing it people) we made it to number three in the row via the Japanese and Panama Embassies. Despite cries to the fact it was spitting with rain I forced the tour back down to what should have been pub number one, the Kings Head on the corner of Shepherd Street and White Horse Street. 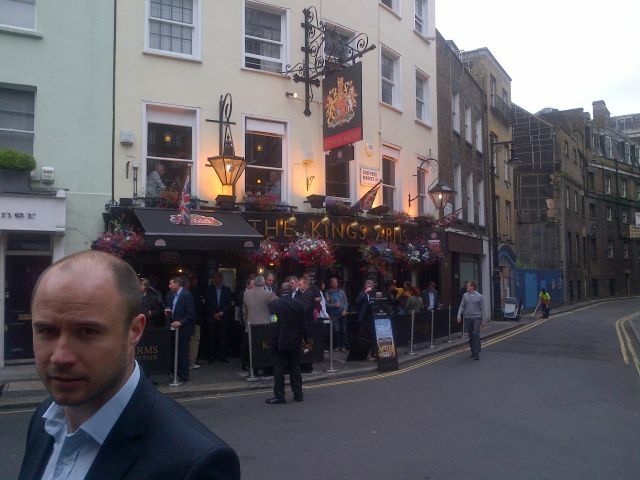 The Kings Head - No, not the bloke at the front! This is a very nice and cosy Taylor Walker place with low black beams and a country pub feel about the place. 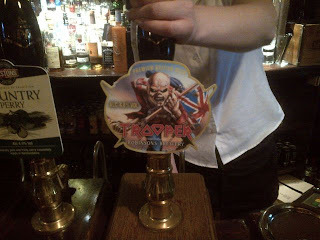 The pub was full but not bursting and we managed to get the order in (pints of Iron Maiden themed Trooper from Robinson Brewery for the ale drinkers - same again for the non ale drinkers) and find a place to stand that didn't cause too much of a blockage. We also managed to locate both the certificate and Spikey Haired Ed and No-Nickname Michael who due to work commitments were following on behind. Now, I do have to explain the main topic of conversation of the night which I hope isn’t as a direct result of something that happened on the last tour. During the last evening out I was challenged to play the game of “Snog, Marry, Avoid” or rather the version that the Pay Roll girls had cooked up which was “Snog, Marry or Push off a Cliff”. Perhaps I should never answer these things as honestly as I always do but I really hope it wasn’t the fact that I declared that I felt Nicole would make damn fine marriage material that resulted in her resigning from her job and planning to move to New Zealand! But I’ll still be buggered if she thinks she’s getting the cat in the divorce! Number two pub in the row of three was the Market Tavern, an M&B owned place which, for those of you interested in spotting blue plaques, was the former home of East Enders actress Wendy Richard. The place had a much classier feel than the Queen Vic and it was beers all round again with Adnams seasonal Fat Sprat whilst Rob had to do with a bottle of Peruvian Cusqueña and George was downing the vodka and cokes like no tomorrow (hey, sod that dissertation!) We were much more cramped in this place and I unnerving ended up by the door to the gents which was signalled by a life sized poster of Michelangelo’s David, not necessarily the exact place you want to stand. The certificate was also nearby though and even though it was showing an expired date I managed to get a scan. Pub number three in the row, the one we'd originally arrived at first was the ShepherdTavern, another Taylor Walker place but this time decked out in their garish red paint job that they seem to do from time to time. 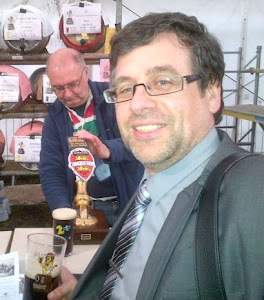 The beer selection was also pretty garish with only a choice of London Pride and Sharp’s Doombar on offer. There were old Cask Marque certificates a plenty behind the bar but all of them the version without the QR code which meant our mini-run of scans came to a crushing end. 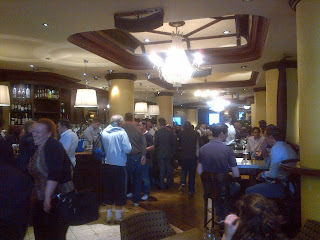 The Thursday night crowds looked to be thinning out slightly though as we found a nice bug space to stand in. With the paucity of beer choice I chose London Pride for Charlie, Nicole and myself, the only three still sticking with beer. Big-J and Gemma moved on to coke, their excuses being a bike ride home and headaches (in that order) and we all took a big laugh at Ed who was ID’ed whilst buying his pint of fizz. 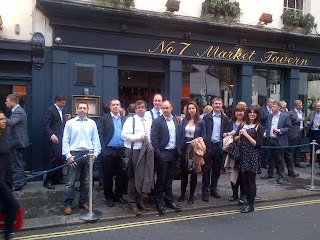 The final place was back towards Piccadilly again and yet another Taylor Walker place, The Rose and Crown on Old Park Lane - This time the beer selection was even worse with only a choice of Old Golden Hen and some bizarre ciders, which Charlie immediately partook of. With Gemma and Big-J still sticking with cokes I was on my ale-lonesome especially when Nicole raised my eyebrows by asking me "to surprise" her - Perhaps the bottle of Grolsch wasn't quite what she had in mind and this was confirmed by the way she quickly swapped it for Ed's pint of Estrella. At least the pub did have the certificate out though, although it was oddly positioned behind the front door meaning each scanner was at risk of being crushed as the scan was taken. 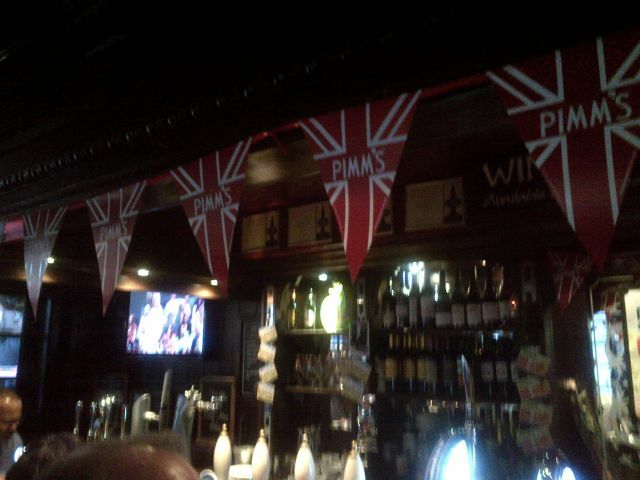 No photos of the Rose and Crown, sorry. 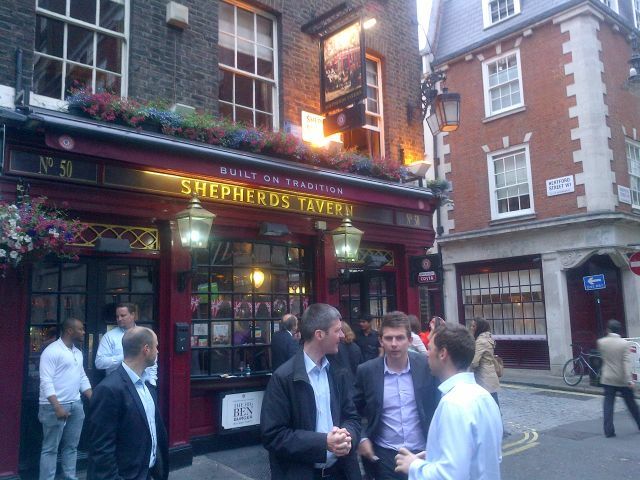 How about Ed, Rob and Pete outside the Shepherd's then? So I'd love to end by saying how the tourists had brought along a top hat and monocle for me to wear as they carried me triumphantly to Trafalgar Square (or somewhere equally notable) but they didn't and as I say, the evening, although very enjoyable, petered out in a late train home and a bloody bus replacement service resulting in far too few hours sleep. But this is not the end! Oh no! Firstly I need to write up a culmination piece on the tour as a whole and then finally, and I'm sure it's been noted by the Monopoly aficionados amongst you that we really do have one final square to complete yet as we haven't actually completed the GO square. The idea is in the bag it's just the date and the places we need to confirm and of course to invite all previous tourists along to celebrate. Perhaps then the top hat and monocle will make an appearance? Will offers of a cocktail night and tea at the Ritz get the decision reversed? = I doubt it. Would you like a Top Hat and Monocle? = Is anyone listening? Yes please!